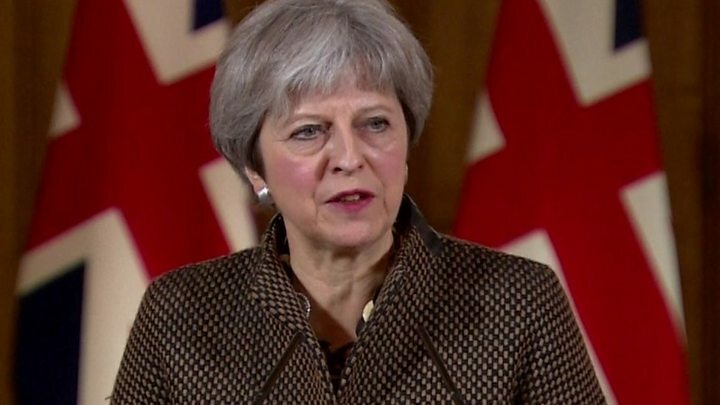 Media captionTheresa May said the UK had taken part in "limited and targeted strikes"
The UK is "confident" that air strikes carried out by Britain, the US and France on suspected chemical weapons facilities in Syria have been successful, the PM has said. Theresa May also said it had been "right and legal" to take action. Military bases near the capital Damascus and the city of Homs were targeted, after an alleged chemical attack on the Syrian town of Douma. Jeremy Corbyn called it "legally questionable" in a letter to Mrs May. Downing Street published a summary of the legal advice it received on the strikes, stating that the UK was "permitted under international law" to take measures to "alleviate overwhelming humanitarian suffering". Syrian state media said the strikes had been "a flagrant violation of international law". The UN Security Council will meet on Saturday at Russia's request. Speaking in Downing Street, Mrs May said the "limited and targeted strikes" had degraded Syria's ability to use chemical weapons. "This collective action sends a clear message that the international community will not stand by and tolerate the use of chemical weapons," she said. Drawing a link with the recent nerve agent attack in Salisbury, Mrs May added: "We cannot allow the use of chemical weapons to become normalised - either within Syria, on the streets of the UK or elsewhere." Mrs May will make a statement in Parliament on Monday and give MPs a chance to ask questions. Mr Corbyn said MPs should have been consulted before the strike and earlier called on the PM to "publish in full the legal justification and basis for" the action. 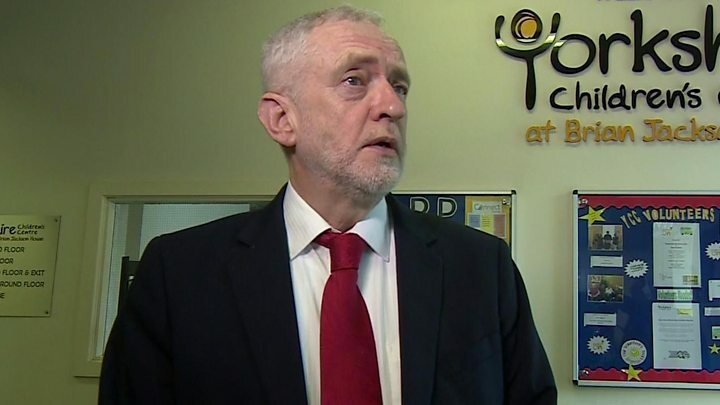 The Labour leader added that weapons inspectors were on their way to verify the use of chemical weapons by the Assad regime. Whitehall officials say the aim of launching strikes against Syria has been to deal a big enough blow to the Assad regime that it deters it from using chemical weapons again - but not so big as to alter the course of the Syrian conflict or draw retaliation from Russia. Planners took the view that the limited US missile strike on Shayrat airbase a year ago had failed to dissuade the Assad regime from using poison gas. Before the green light was given by the prime minister for RAF participation in today's attack, the defence secretary spent time with the attorney general going over the legality of the targeting in precise detail. I am told that the lessons of the Chilcot Report - into the mistakes made over the Iraq invasion of 2003 - have been uppermost in people's minds. Decisions, phone calls and sign-offs made over the last few days may one day have to be scrutinised by lawyers. Russia too has been a major factor in choosing which targets to attack. Planners believe that the best way to mitigate against any Russian retaliation was to warn them in advance and avoid hitting any Russian positions in Syria. The Ministry of Defence said eight Storm Shadow missiles had been launched by four RAF Tornados at a former missile base, 15 miles west of Homs. It is thought President Bashar al-Assad's regime had been stockpiling materials used to make chemical weapons there - in breach of Syria's obligations under the Chemical Weapons Convention, it said. A spokesperson added the facility was "located some distance from any known concentrations of civilian habitation", and scientific analysis was used to "minimise any risks of contamination to the surrounding area". A Nato meeting will be held on Saturday where Britain, France and the US will brief allies on the action taken in Syria. US President Donald Trump tweeted it was a "perfectly executed strike" and thanked France and the UK for their "wisdom and the power of their fine military". He added: "Could not have had a better result. Mission accomplished!" Prime ministers don't choose the decisions that face them. But they have to judge which way to jump. In 2013, Theresa May's predecessor tried and failed to get approval for military action against President Assad. There was international alarm, then as now, about his suspected use of chemical weapons. But MPs rejected David Cameron's plan and he didn't try again to persuade Parliament it was necessary. This time, she has avoided that particular obstacle by taking action alongside the US and France while MPs are away. Addressing a press conference on Saturday, Mrs May said she believed the strike action had been "the right thing to do" and was "absolutely in Britain's national interest". She said the UK government "judged it highly likely" that Syria had been using chemical weapons, and it was "clear" the Assad regime was responsible for the "despicable and barbaric" attack on civilians on 7 April. Evidence suggested a barrel bomb and a regime helicopter had been used, she added. "No other group could have carried out this attack." The action was "carefully considered" and the "minimum judged necessary for that purpose"
Defence Secretary Gavin Williamson said Britain, the US and France had played an important role in "degrading the ability of the Syrian regime to use chemical weapons". 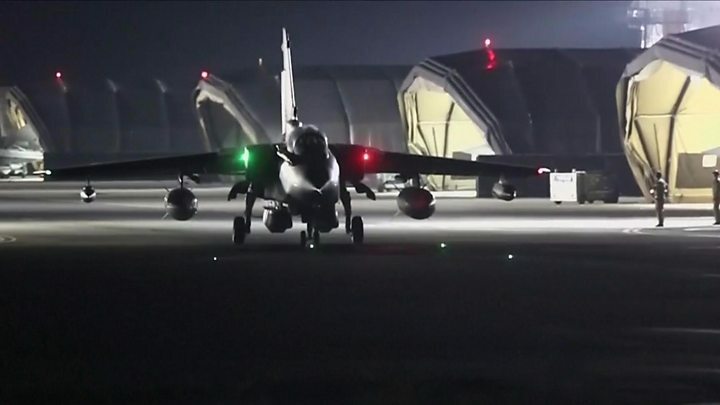 Reporting from RAF Akrotiri in Cyprus, the BBC's Jonathan Beale said the UK's Tornados had left the airbase in the early hours of Saturday. He added the cruise missiles had been fired "well away from Syrian airspace" and were out of the range of the regime's air defences. Meanwhile, President Vladimir Putin of Russia - Syria's key ally - said he "condemns the attack in the most serious way". And Syria's official Sana news agency said "American, French and British aggression against Syria will fail". In the UK, Scotland's First Minister Nicola Sturgeon said Mrs May had not answered how the action, "taken without parliamentary approval, will halt their [Syria's] use" of chemical weapons, "or bring long term peace". Liberal Democrat leader Sir Vince Cable also said MPs should have had a vote on the action, adding: "Riding the coat-tails of an erratic US president is no substitute for a mandate from the House of Commons." Plaid Cymru leader Leanne Wood accused the government of being "reckless" and said the strikes "risked an escalation" that could put "our security as well as the lives of innocent people at risk". Northern Ireland's Democratic Unionist Party said Mrs May had "the full authority" to order the air strikes and it rejected "any suggestion that she was not entitled to do so". What did the UK use? The RAF sent four Tornado GR4 aircraft from Cyprus, each armed with two Storm Shadow cruise missiles. The Tornado has been one of the mainstays of the RAF since first entering service in 1980 and the aircraft were used to enforce no-fly zones in Iraq. Weighing in at 2,866lb (1,300kg), measuring 16.7ft (5.1m) in length and with a range in excess of 150 miles (240km), the "bunker busting" Storm Shadow has been described by the air force as "arguably the most advanced weapon of its kind in the world". The range means that none of the GR4s would have been required to cross into Syrian airspace to launch the assault. The aircraft were sent from RAF Akrotiri, a British base since the 1950s on the southern side of Cyprus, some 213 miles (343km) west of Homs. Syria: What can Western military intervention achieve?